Please join us at the upcoming trade shows listed below. Valley Design technical sales and management team will be available to discuss your project requirements. We will also be displaying a wide variety of samples to showcase our diverse capabilities including glass and fused silica wafers of all sizes, stainless steel wafers, precision shims and spacers of ceramic and glass, aluminum nitride and alumina substrates and components, silicon wafers, polished vacuum chucks, color filter glass products, lapped, polished and diced materials of various types, CNC machined parts, and many others. If you need more information about Valley Design's presence at these shows, or would like to receive free exhibition passes, contact us at info@valleydesign.com or call our customer service team at 978.425.3030 today. We would be glad to hear from you, and all of us hope to have the opportunity to see you at these shows! 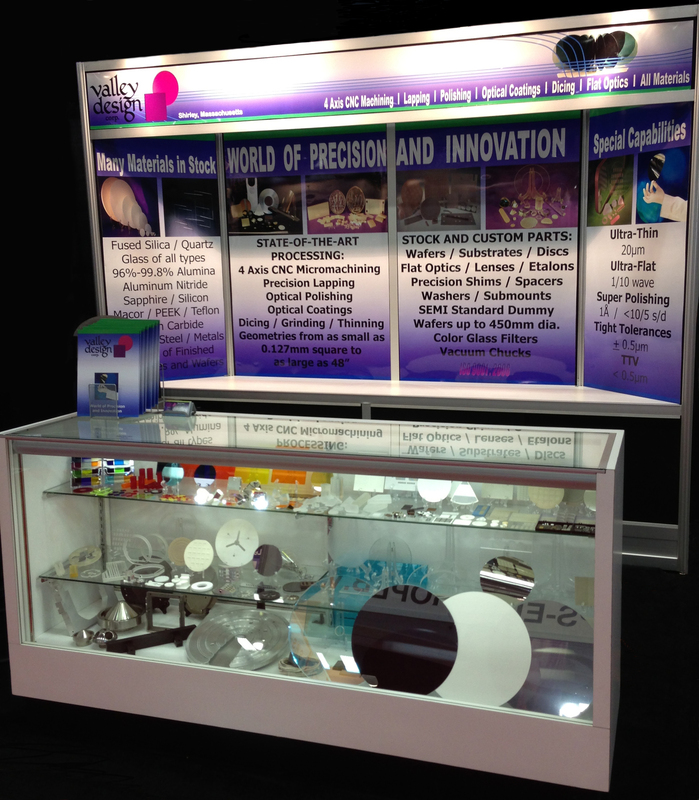 LASER, World of Photonics is the world's leading trade fair for photonics components, systems and applications. Together with the World of Photonics Congress, the fair unites research and industry, and promotes the use and ongoing development of Photonics technology. LASER sets increasingly higher standards in size, diversity and relevance, and it is the only event that features the entire range of Photonics Solutions: Research, Technology and Industry. Don't miss this important event! For all the facts, and to register click here. Photonics West is the premier laser, photonics, and biomedical optics conference, and covers a wide range of topics including: optoelectronics, biophotonics, microfabrication, biomedical optics, industrial lasers, displays, and MOEMS-MEMS (Micro-Opto-Electro-Mechanical-Systems / Micro-Electro-Mechanical-Systems). For all the details, and to register click here.